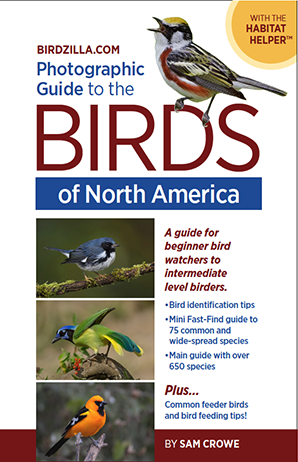 New Photographic Guide to the Birds of North America! The new bird guide is specially designed for beginner to intermediate level birders and uses habitat as the intiial filter for finding a bird you have seen. The guide is in its final review stage and will be published in the next couple of months. The new Birdzilla.com guide contains nearly 2,000 high quality photographs of over 650 species. Here is your chance to participate by helping to select the cover of the guide. Three options are below. Please vote on your favorite. You may have to scoll down to see all three options or the submit button. Sign up for Early Bird Special Offer! Sign up for publication news. We'll let you know just before the guide is available in stores. If you order you will receive a signed copy, a 10% discount, and receive free shipping in the continental United States. We will not spam you or sell your information to anyone else. Information on new photographic bird guide.